The Silver Mexican Libertad coin is the official silver bullion product of the nation of Mexico. 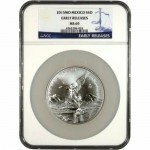 Struck by the Mexican Mint on an annual basis, and authorized by Banco de Mexico, it is one of the more unique bullion coin programs in the world today. 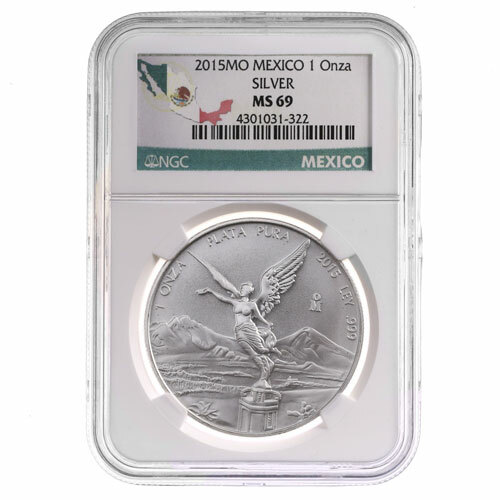 You now have the chance to purchase a 2015 1 oz Silver Mexican Libertad Coin in near-perfect condition on Silver.com. 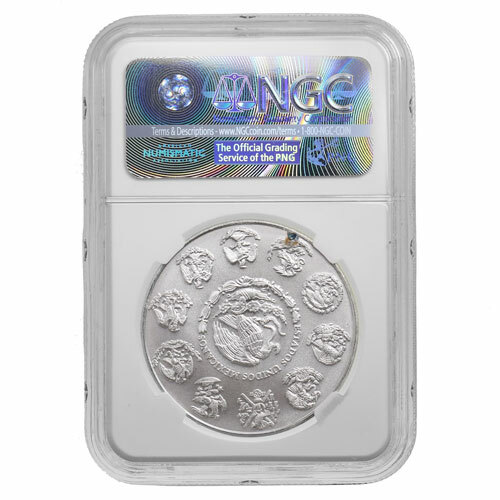 There are only 3,365 coins currently available in this condition from the NGC! Arrives in a plastic slab to protect its condition. Graded MS69 by the NGC. Inspired in design by the gold Centenario coin. When the nation of Mexico set about celebrating 100 years of independence in 1920, the country undertook a number of projects and programs. Among them was the released of a gold coin with a face value of 50 pesos released by the Mexican Mint. This coin revived popular images from the nation’s War of Independence in the 1820s, including the image of the Angel of Independence, and the country’s first coat of arms. Both images appeared on the Centenario from 1921 to 1947, and were brought back (and eventually modernized) for use on the Silver Mexican Libertad. 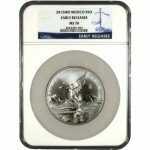 Each of the 2015 1 oz Silver Mexican Libertads in this posting is a near-perfect specimen according to the NGC. A coin with an MS69 grade has its full, original mint luster, but also as many as two minor detracting flaws. The obverse of each coin features the image of Winged Victory, as she appears on the Victory Column in the center of Mexico City. The broken chains in her left hand symbolize the destroyed bonds of colonialism, while the wreath held aloft in her right signifies the freedom of self rule. On the reverse you’ll find the modern coat of arms for Mexico. On the larger coins in the Silver Mexican Libertad series, including this 1 oz weight, you’ll also find 10 historical versions of the coat of arms encircling the modern version in the middle. If you have any questions, please don’t hesitate to ask a Silver.com associate on the phone at 888-989-7223. You can also connect with us online by using our live web chat feature or submitting your questions in writing via email.